What Does Form Mean In Football? Now and again Soccerwidow receives enquiries as to whether we consider ‘form’ in our match analyses and value bet recommendations. The reader will have to excuse our increasing ignorance of the concept of ‘form’ and we dare to propose that the true meaning of the word is completely unclear and misunderstood by many. Take the historical results of the last 25 games of each team (i.e. 25 home games if that team is playing at home and vice versa) and combine these with the head-to-head meetings of both teams at that venue over at least the last 10-years to compile an initial odds computation. The probabilities of each betting option are then calculated (form plays no role at this stage!). After the probabilities of each event are determined, we calculate what the corresponding odds should be and compare them with the market odds. Only bets where the market odds and our own calculations deviate are selected. Usually there are four or five potential ‘value’ bet candidates, but sometimes there are none (meaning that our own odds computations correspond accurately to the market odds), and more rarely, there are more than five potential bets. For making the final selections (picks), taking into account an element of ‘form’ becomes necessary. We look at the last six matches in a little more detail and consider against which teams these results were achieved (whether relatively weaker or stronger teams). We may also read a few current articles about the teams in general such as the injury news, suspensions, et cetera, before establishing the final short-list of bets determined as holding value. This approach seems to work admirably as the picks always seem to bring around 25% rate of return but, whether this strategy considers form sufficiently enough, is open to question. In summary, the term ‘form’ is both misleading and mysterious. No-one seems to know precisely what it means. What exactly does one understand by the term ‘form’ when applied to teams in a football match? So, this article is just questioning the concept of ‘form’ and we wish to encourage readers to start a discussion on this topic with an attempt to define and explain what really is meant by it. There seems to be no real clarity either in the Internet or other literature. Please drop us a line using the comments box below. Thank you very much in advance, for your valued opinions and contributions! An interesting case study would be the meeting Sheffield Utd vs. Scunthorpe from todays League One :D.
I say it would be interesting, because Sheffield somehow never managed to beat Scunthorpe, both teams relegated but Scunthorpe seems to be in free fall this season, while Sheffield will probably go back to the Championship. I am inclined to give more credit to the H2H history, where a relevant one there is. A football club i think is a living entity and although player and trainers come and go, some teams have their absolute fear-nightmare opponents with which they cant win. It doesnt even matter if they play or not in the same league anymore, the psychological factor keeps one team failing to win because of the mutual history. if there is a h2h history I’m giving it up to 50% credit in my computations of probabilities, but only if there is a record of a minimum of 8 comparable matches in the last 10 years. These match predictions are actually the most successful of all my picks. Teams with no history are very difficult to predict with any accuracy and the results are very volatile. 1) Yes, right. Our system only considers the statistics in respect of the home team’s recent games and those of the away team. We don’t cross-over into taking both home and away form for each team into consideration. 2) We only look at a very select few European games where it is easy to find the respective club’s recent results/performances. If it’s a Premier League match, we only use the last 25 league games (excluding all cups). If it’s a domestic cup game, then the last 25 games including all domestic cup results. Re off topic Q’s = We’re just football (soccer) and nothing else, although the statistical principles we preach are transferrable to any other sport or event. We use mainly betting exchanges, Betfair & Betdaq, but also some traditional bookmakers and only ever the well-known names where liquidity and equity are never an issue. We make a living from betting, writing external articles and running Soccerwidow. Panos, your English is very good and don’t worry about it! Thanks for your time and interest in Soccerwidow. I really don’t like maths or statistics, but i like problem solving if i have my way around it. This is where betting comes in. I keep researching or try to develop a system to win consistently but not 100%. The game of online roulette is very challenging but with sites like moneymakermachine that develops and design software to test roulette strategies without risking a dime, i have hope that i will develop something that wins consistently. Like in the United kingdom i know genuine a tip site that offers sports and horse racing picks with consecutive wins of more than 14 and max losing runs of 3 for over so many years. Though most of the odds are odds on, but the soccer usually around 1.50 to 2.10, but on average 1.50 for most picks, which would be profitable with a martingale system, progression of 4 bets using a bank of $300 to make $150 every 30 days, but i want to reduce the risk and increase the payout. I know i will make a living from betting wisely. Treat it as an investment not gambling, even though it involves forecasting just like FOREX trading which is more distinguished compared to betting. Here on this site i know they make a living placing bet http://www.sportsbookreview.com the forum. 1ºSo you don’t take into consideration in this case games away from chelsea or tottenham at home , right? matches from premier league , or do you includes fa cup and carling cup between the last 25 matches? 3º in the last 6 matches in detail , you mean 6 last matches in overall? e.g. chelsea last 6 matches home & away? or just home matches from chelsea , and just away matches from Tottenham? 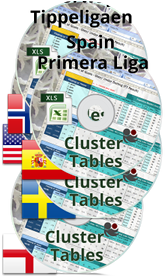 4º You have said that you have put Danish league into excel… Did you do it manually (time-consuming a lot) or did you copy & paste from some website(not so much work) ? Do you bet on Greyhound racing /Horse racing or other sport like Tennis , NBA or just in soccer? Do you bet in traditional books , exchanges or both? , i have heard that traditional bookies put limits if you are a winner (and sometimes you can suffer nonpayments ) , this not happen in exchanges i think because theorically you bet against other users . Greetings and sorry because for my bad english , i understand english 80% but i use google translator when i want to write. There are sometimes real ‘goldmines’ to be found on the Internet, no question. Something challenging me is the correct score picks published by http://invarius.ivnet.ru/soccer/champ/champ.htm Sometimes the success rate is as high as 20 to 25% in one weekend. This is scary! However, I have not yet succeeded to work out how the guy behind this site arrives at his/her predictions. Well the parent site owner has been using this system secretly for more than the aforementioned month above. I am planning to me with the Goldmine site owner and the parent site owner, they both operate on same frequency and originally i feel the parent site owner is behind the system.I am working hard to know how this picks are made, but i guess they have some cogent stats information to protect. I read through the home page as well as the other forum threads and it seems that the approach of the website owners is exactly as I’m preaching in my blog: statistical – mathematical. They achieved with their ‘over 2.5 goals’ prediction a rate of 75% which is absolutely possible when applying statistical analysis to picks. The ‘laying multiples of 3’ has now won for 30 days in a row and this is possibly a little bit of a lucky chance, but assuming that the picks are made picking games with probabilities of 30% and under to win, then the likelihood that all three bets win is 30% x 30% x 30% = 2.7% – this means that there will be no more than 3 multiples in 100 days which lose (hope this makes sense). “Never bet what you can’t afford to lose. Don’t try and be too clever! Bet on what you know. Don’t bet on teams you are emotionally disposed to. Well i have being monitoring the picks and result on a site and for the past 2 months and some few weeks now haven’t lost even a single lay multiple bet on treble pick(Laying 3 teams to lose, wherein if only 1 out 3 loses you get back your stake). My curiosity is how they consistently make the right picks. The picks are posted before kickoff each day,mostly the night before. Share the website please – I’m now curious. Sorry, no, we haven’t looked into such a system yet but it sounds interesting enough to investigate some time in the future. Let us know even if you have moderate success with any of your ideas and perhaps we can provide tweaks that turn good ideas into winning ones. Hi Soccerwidow ,i have plenty questions but for today i have just 2 simple questions. 1º Do you use only excel to make the analisis or some other software is essential to keep better the analysis? 2º , Do you bets only in leagues provided by football data.co.uk (excel tables) or you create data base from more leagues (e.g. scandinavian soccer etc) not provided by football-data yet.? 2) we do predictions on any league/cup game where the last 25 results of both teams are available (e.g. the last 25 home results for the team at home and vice versa for the away team). We also use head-to-head results in our analysis where these too are available. Doing it this way is so much more time/cost effective and the accuracy of the predictions is pretty good at the moment in our Betfair articles on the English and German Betfair blogs. I have put together a five year analysis of the Danish league (where statistics are not available from http://www.football-data.co.uk), but the time it took and the pain/suffering I endured were enough to tell me that I don’t need to do this exercise too often! Keeping something like this up-to-date is much easier than creating it from scratch!